Don Garden presented the synopsis for this strip to ERB in December 1938. He based the storyline on the radio script of the same name by Rob Thompson. 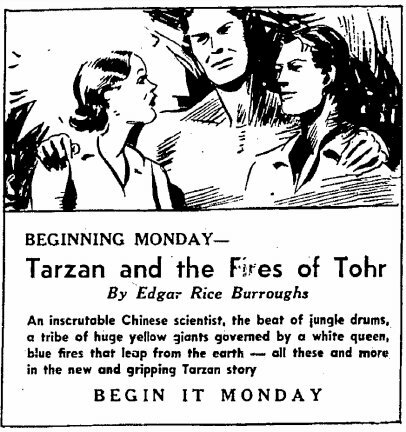 Tarzan and the Fires of Tohr had been inspired by ERB's novel, Tarzan and the City of Gold. Ed approved the synopsis with no requests for changes or corrections. 4715: 157-162 . . . . . .
4752: 426-431 . . .
(11 Jan. 1941-10 Apr. 1941) . 4757: 480-491 4758: 492-501 4759: 502-508 . (11 Apr. 1940-30 July 1941) .
. 4785: 810-821 4786: 822-828 .